In cooperation with the premier School of Theology and Religious Studies at The Catholic University of America, Theological College has implemented a five-year S.T.B./S.T.L. program. It promises to be one of the top programs of its kind in the country. Newly ordained priests who return to TC for one additional year will have the support and privileges of the seminary community while living in a separate, newly renovated residence, Providence Hall. Though not a mandate, it is preferable for seminarians to begin this track in their first year at TC, so that they will complete the S.T.B. and S.T.L. degrees within five years, inclusive of ordination requirements by the end of the fourth year. The Graduate Record Examinations (GRE) or Miller Analogies Test (MAT) are required for entry into this program, and the GPA for admission to the S.T.L. is 3.0. Foreign language requirements for S.T.L. studies are ideally taken during summers in S.T.B. studies through intensive programs offered in the arch/diocese or through online programs offered at Catholic University (e.g., Greek, Latin, Modern Language). Successful candidates will receive an S.T.L. in Biblical Studies, Church History, Liturgical Theology, Sacramental Theology, Moral Theology, or Systematic Theology, with notable scholars in the field as their mentors. For more details about program requirements visit the School of Theology and Religious Studies S.T.L. page. 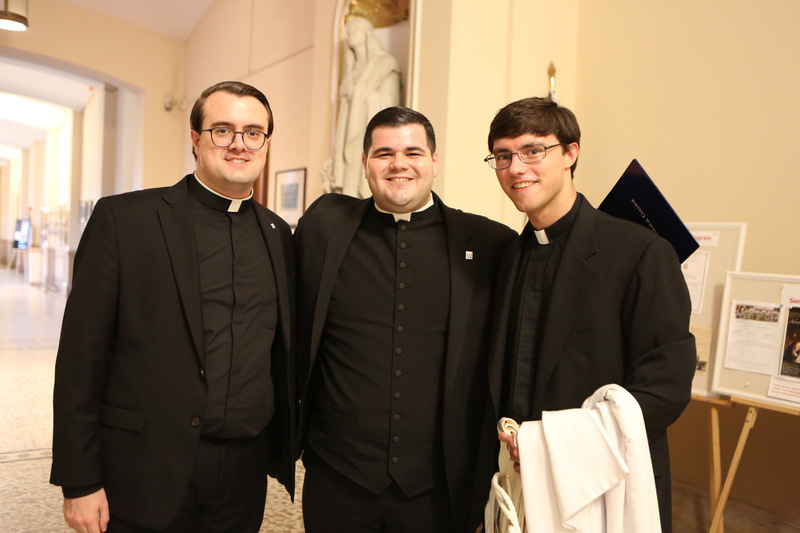 Above: From the Class of 2019, from left, Deacons Michael Russo (Washington), Matthew Browne (Rockville Centre), and Walter Genito (New York) are the first graduates of TC’s theologate program to return as priests to earn the S.T.L. in 2020.